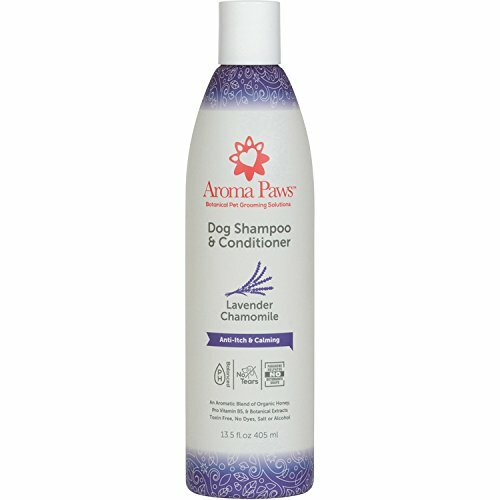 Aroma Paws Shampoo & Conditioner is blended with Green Tea Leaf Extract for a shiny coat, Aloe Leaf Extract to soothe skin, and Sweet Almond & Coconut Oils to relieve dryness and detangle. Our all natural, CHEMICAL FREE cleansing agents will safely, gently and naturally cleanse your dogs skin & coat. CONTAINS NO:DYES, PARABENS, ALCOHOL, SALT, PHOSPHATES, SYNTHETIC FRAGRANCE French Lavender Oil relaxant & skin soother Roman Chamomile helps restore pH balance to dog's skin & coat Ylang Ylang Oil softens skin Eucalyptus Oil naturally refreshes and cleans skin Great for Dogs with Anxiety, helps calm during bath time A CHEMICAL FREE PRODUCT PH BALANCED, Bio-degradable & Tearless Formula. If you have any questions about this product by Aroma Paws, contact us by completing and submitting the form below. If you are looking for a specif part number, please include it with your message.